Suitable for use in hot and cold water Hypoallergenic Suitable for front loader Grey water safe and biodegradable Tired of buying 'natural' laundry powders that don't work and still irritate your skin? Stop looking! This range has been especially developed for you! 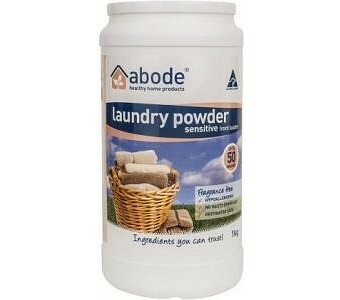 The Abode Sensitive Laundry Powder is one of our most popular products because it is suitable for the most vulnerable in our society - pregnant women, children, the elderly and people with skin and chemical sensitivities. Created using the best quality ingredients that money can buy, it is free from fragrances, petrochemicals, zeolites, phosphates and salt used in most normal products. It is so concentrated you only need to use a tablespoon not a scoop! Ingredients: Soda ash (alkalinity builder), baking soda (food grade), sodium citrate (food grade), sodium carboxymethyl cellulose (derived from coconut oil), sodium coco sulphate (derived from coconut oil), sodium disilicate (derived from sand), alkylpolyglucosides (derived from corn, wheat and coconut) and sodium lactate (food grade).